This is easy to forget: God doesn’t value a far-off there more than an ordinary and near here. And every there for us is someone else’s here. “The earth is the Lord’s, and everything in it, the world, and all who live in it” (Ps. 24:1). Yes, a few are called to go but most are called to stay and this is no lesser of a story to be living. If God is everywhere, and He tells us that He is, then He loves all the earth and we can serve Him in any corner of it—including the one at the end of our own street. And we are all missionaries because none of us are “Home.” We are all in a foreign place, in a culture where we are not true citizens but sojourners. “Our citizenship is in heaven” (Php. 3:20). We can honor God in the familiar. We can seek Him in the sameness. 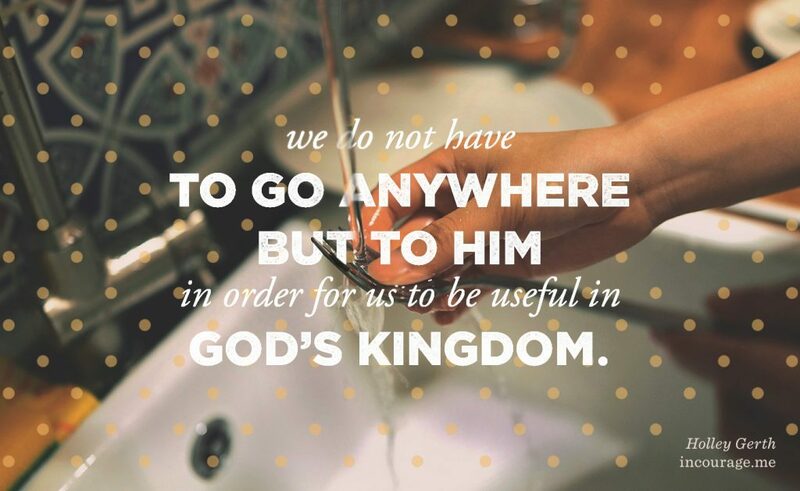 We do not have to go anywhere but to Him in order for us to be useful in His Kingdom. For those called to step on a plane or a train or boat…go with the blessing of God. For those called to stay in a kitchen or a conference room or at a desk in a class…stay with the blessing of God. “Missionary” simply means someone who has or is on a mission. If that’s the case then we all bear that name. Yes, let’s give special care and honor to those for whom it is also an occupation. But in doing so let’s not diminish the privilege we all have of being part of a great mission too. We have been sent. You have been sent. I have been sent. We were sent the second the first spark of life flickered in our mother’s womb. To this earth. And now to wherever we are today.